"Debtsperation" is not a word that you will find in Webster’s unabridged dictionary. It is though, being defined on the front pages of leading newspapers around the world today. It has to do with the global financial panic and smoldering debt crisis. Europe was rocked on Wednesday, when Germany was unable to sell all their government bonds that were put up for auctions, as 35 percent went unsold! Until now, Germany was able to point to it’s solid economy and public spending cuts as the answer to the region’s debt woes. Germany has been the most vocal opponent of having the European Central Bank act as a lender of last resort to bail out national governments caught in this terminal debt spiral. Euro-zone technocrats say they are determined to save the Euro, the common currency. It seems as though, the people with money are voting with their feet. There has been a startling drop in corporate bank deposits. Recently in Italy, deposits shrank 12% and in Spain 20%. This is occurring just as the Europeans are mandating that these banks increase capital levels to insure stability. The European Central Bank is providing emergency funding for Greek, Portuguese, Irish, Spanish, Italian, and French banks! Where is all this heading? Please don’t worry, they have a plan. 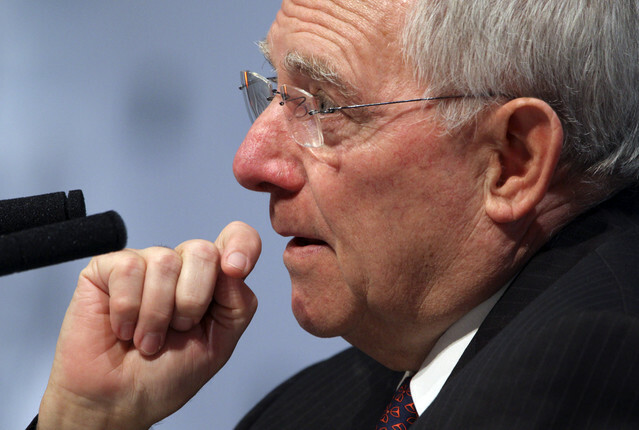 Wolf-gang Schauble, the current German finance minister sees this impending financial meltdown as a catalyst. It will help finish the uncompleted job of unifying Europe into a super-state. He is a close confidant of Angela Merkel, Germany’s prime minister. He seems to be at the right place at the right time to get the job done. He sees the turmoil not as an obstacle but as a necessity.